Soon you'll arrive at the Grand Canyon West Rim where and you have around three hours to enjoy the amazing views and take a leisurely walk along the rim to see how Mother Nature carved an image of the Great Thunderbird into the cliff of the Canyon. The Grand Canyon National Park officially opened The Skywalk in March 2007 and it has quickly established itself as a major attraction. This cantilever shaped glass walkway suspends more than 4,000 feet above the canyon’s floor and extend 70 feet from the canyon’s rim – allowing you to walk out into the Canyon and savour amazing bird's-eye views. To avoid long wait times, we recommend that you activate your Skywalk Ticket when arriving at the West Rim so that you can maximize your free time to explore all that the area has to offer. Please note the Grand Canyon West Rim is more rugged and less developed with limited modern upgrades. It is therefore recommend that those requiring wheelchair assistance consider the Grand Canyon South Rim Tour by Coach option. Not recommended for those in a wheelchair due to the rugged, undeveloped nature of the West Rim. 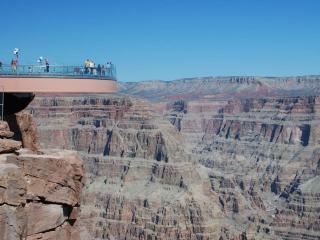 Those who require wheelchair assistance are recommended the Grand Canyon South Rim Coach Tour.